The Petroleum and Natural Gas Senior Staff Association of Nigeria (PENGASSAN) has urged the Federal Government to tackle the resurgence of militancy and oil pipelines vandalism in the Niger Delta. The President of the Association, Mr Francis Olabode-Johnson, made the call in an interview with the News Agency of Nigeria (NAN) in Calabar. According to him, the current fight against pipeline vandalism and crude oil theft in the region has not recorded the desired success and needed to be intensified as the act has continued. He said the country had continued to lose huge revenue owing to the bombing of oil pipelines by militants, stressing that ``I am calling on the Federal Government to effectively check the activities of militants and pipelines vandals in the Niger Delta region. 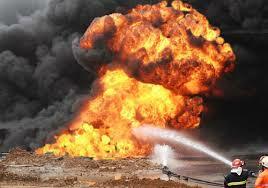 ``Nigeria is losing a large percentage of its revenue due to the activities of the militants. The PENGASSAN boss added that modern technologies should be used in such a way that vandals could not access. ``We also expect the managers of these pipelines to imbibe the culture of regular maintenance while government lives up to its responsibility of providing security to these national asset,” he said. Olabode-Johnson appealed to the security agencies protecting the pipelines to be more resolute in carrying out the assignment.